In this tapestry 'Fruit and Flowers' we see a delicate arrangement of flowers and fruit. Rustic in style, and masterful in its composition and use of color and light, this tapestry is sheer delight. The nearby next of eggs and young bird adds life to this scene. The Dutch, French and Italian artists have used flowers as subject matter for their paintings and tapestries for centuries. 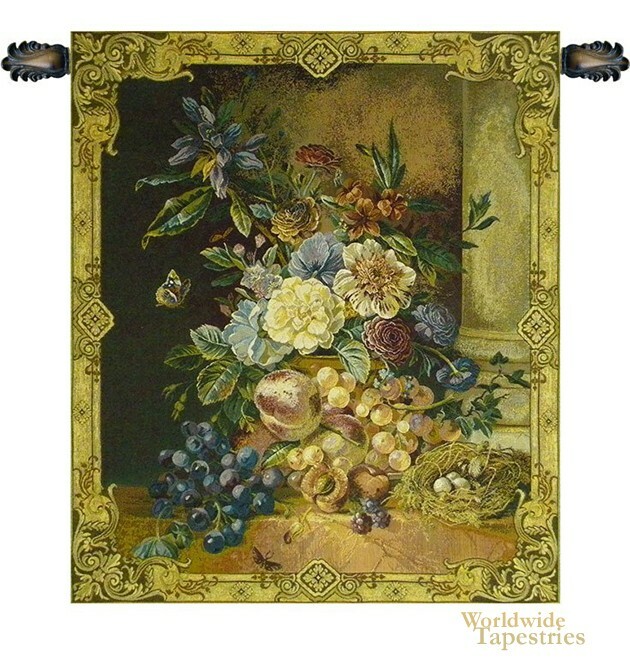 The beauty of nature is was used in tapestries to make for an elegant addition to any home. The scroll design border frames the central subject matter in the centre of purples, crimsons creams and greens. There is a refined balance in structure and use of color in this tapestry that is very pleasing. This tapestry is backed with a lining and has a tunnel for easy hanging. Note: tapestry rod and tassels, where pictured, are purchased separately. Dimensions: W 24" x H 28"